Yes of course there is crime, and violence and murders, but perhaps not out of all proportion to the place that it is… Bogotá, a city of 8 million people. Despite the appalling tabloids with their daily dose of blood-curdling tales, Bogotá (or the little of it that I have got to see) has turned out to be a city of remarkably decent people, ready to enquire where you’re from and kick off yet another series of questions leading to the inevitable “what brought you here then?” (I just wave the wedding ring at them now, and male taxi drivers tend to smile back in a conspiratorial sort of “oh yeah, Colombian women know how to knock out a gringo” way…). 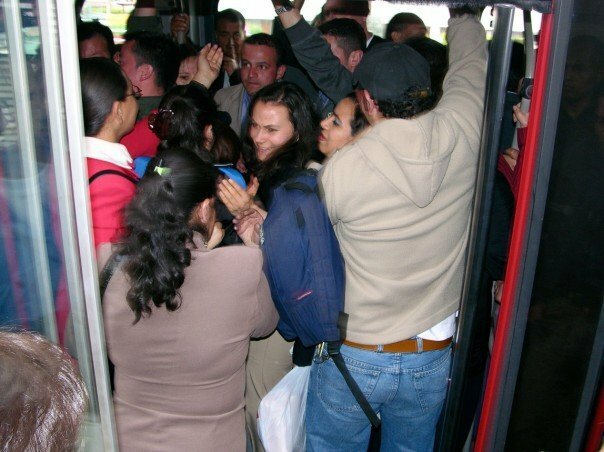 One thing that always makes me marvel at how much Bogotá can differ from the image we had of it as a city where you’d get your throat cut for the sake of the coins in your pocket is the delivery of the bus fare to the drivers of the overcrowded urban buses at rush hour. These buses are stupidly small, and the gaps between the seats aren’t wide enough to squeeze a shoulder bag into, never mind your legs. At rush hours they get jammed to the point where they resemble Indian trains, with people hanging out the doors. When the front end of the bus has filled up so that no one else can physically board, the drivers collect the next passengers through the rear exit doors. This presents a logistical challenge to the new passengers, for the gangway of the bus has about 10-12 people crammed into it. The passage to the driver to hand over the 50p fare is impassable. So the person at the back hands their cash to the next person, and the 50p travels from hand to hand, up the length of the bus, until it is delivered to the driver. And then the change comes back the same route. Even trifling amounts of change like 100 pesos, about 3 pence. So despite all the fear of criminality and robbery that stalks this city’s collective psyche, when it comes to helping each other out on an overcrowded urban bus, Bogotanos engage in a little routine of social solidarity that never fails to impress me with its silent dignity and total lack of opportunism. Then we opened the door tonight to leave the last of the rubbish out, only to find an unwashed, scruffy recycler, standing over our recently deposited bags of offcuts from the kitchen units, replaced light fittings, and pizza boxes, with his shopping trolley loaded up with the loot from other piles of rubbish. The thing was he was about 10 years old. And it was 9pm. Pati walked over and pointed out to him where the old light fittings were, for they would be something of potential value to him, and asked if he wanted the cardboard, but he explained he only sorted metal. She paused, and asked him if he was on his own, but he pointed down the street and cheerfully replied that he was working with his mum. His shopping trolley was even in proportion, it was one of the smaller ones that the supermarkets have for kids to wheel around. It is sort of shocking to find someone only a few years older than your nursery school age son standing outside your house in the middle of the night going through your rubbish for the sake of a few pesos. I suppose the Bogotá reaction would be to reflect that he is one of the lucky ones – he’s got a “job”.